All hail the king of Atlantis! 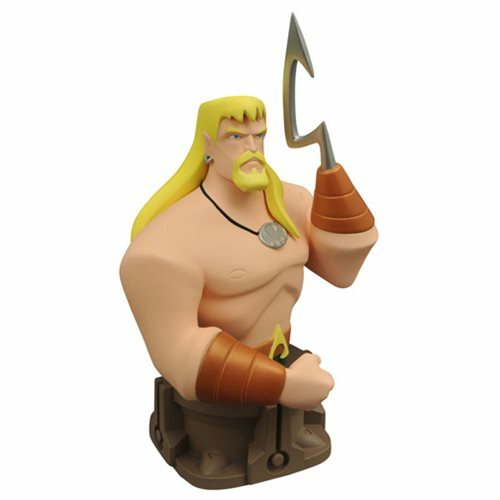 Based on his appearance in the classic Justice League animated series, this 7 1/4-inch tall bust of Arthur Curry, aka Aquaman, features detailed sculpting and paint. The part-time Justice Leaguer and full-time monarch of the Seven Seas sits on a pedestal inspired by the League's Watchtower satellite. Limited to 3,000 pieces, the Justice League: The Animated Series Aquaman Resin Bust is sculpted by Varner Studios and comes packaged in a full-color box with a certificate of authenticity.